A handcrafted pet urn can be a far more personal tribute to the passing of a treasured canine companion than any factory manufactured receptacle. The urn can be customized to suit any breed and have a personalized message. A do it yourself pet urn can be made using a few basic supplies. Start with a traditional basic urn and then add your own touch to honor your beloved pet. Wash and dry the urn. Lay newspapers out on a flat surface. Place the clean and dry urn in the center. Separate the urn and lid. Spray one coat of black matte paint onto the urn and lid. Allow time to dry. Spray a second (and third if needed) layer of paint onto the urn and lid. Let the urn dry for at least 24 hours or according to instructions on the can. 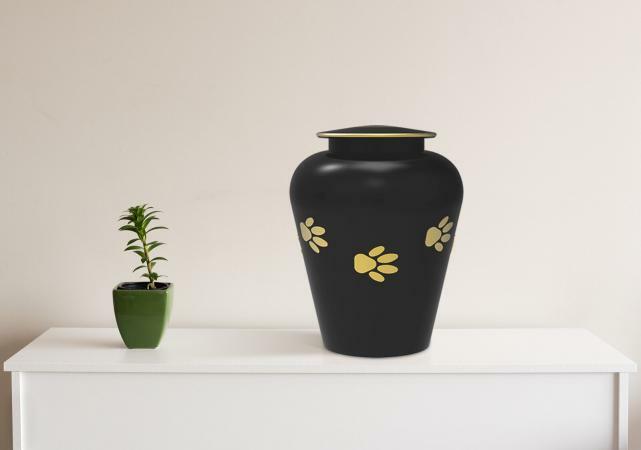 Wrap or place the paw print stencils on the urn. Secure in place with painter's tape. Dip the sponge paintbrush into the gold paint, allowing excess to drip off, and carefully fill in the stencil lines. You may need a second coat after the paint dries. Keep the stencil in place until you determine whether additional coats are needed. While the paw prints dry, wrap the lid with the painter's tape to create the thin edge. Use the fine-point brush to paint gold around the edge and allow the paint to dry. You may need two or three coats. Once the gold paint has dried, carefully remove painter's tap and the stencil. Touch up any spots with the fine-point paintbrush as needed and allow the spots to dry. Spray the urn and lid with finishing spray according to manufacturer's instructions. Allow it to dry. The urn is now ready for use. Handwrite (or use stickers) the date your pet was born and when s/he died. Instead of using paw print stencils, purchase a stencil (or print a silhouette) of your dog's breed to use in the center of the urn. Write your pet's name at the top of the urn using stencils or handwriting. Use Mod Podge to include a favorite photograph of your pet on the urn. Glue your pet's collar around the base of the urn. Hang a small ornament or charm from the lid of the urn. Some people prefer to use wood for creating a box urn for their pet. Canadian Woodworking & Home Improvement has plans for a small wooden maple and walnut urn. The lid has a slight curve to it. The free plans come with a list of supplies, a graphic showing how the pieces go together, and two photo images. Rod Johnson's Woodworking Shop features a rectangle cremation urn for pets. These plans are easy enough a young woodworker (with adult supervision) can complete the project. It includes a list of materials, several plan graphics, and photo images of the completed urn. If you're a visual learner, watching a quick video is the best way to learn how to make an urn for a pet. The clip from Ed Henderson at Heavenly Hardwoods shows how to do it from start to finish. You'll end up with a lovely square box with rounded edges. A cremated dog can stay with you forever if you place his/her remains in an urn. Making one yourself is a wonderful way to grieve and create a final resting place in your home that was made with love.